Hoya imperialis. Photograph: Doug Chamberlain. Hoyas are shooting up the houseplant popularity charts, and so they should: these climbing and trailing vines have lovely foliage and flowers that are otherworldly and sometimes heavenly scented. Doug Chamberlain of Vermont Hoyas joins me to discuss his collection, his favourite species and how to care for these enchanting plants. Check out Doug’s YouTube channel on Hoyas here. Hoya maxima. Photograph: Doug Chamberlain. While you’re listening, take a look at the information below, where you’ll also find pictures of some of the specimens we cover… click on the images to enlarge them. H. macgillivrayi boasts some of the most dramatic flowers of the family. Photograph: Doug Chamberlain. Hoya magnifica. Photograph: Doug Chamberlain. Doug’s first Hoya was H. carnosa ‘Rubra’ from Home Depot! 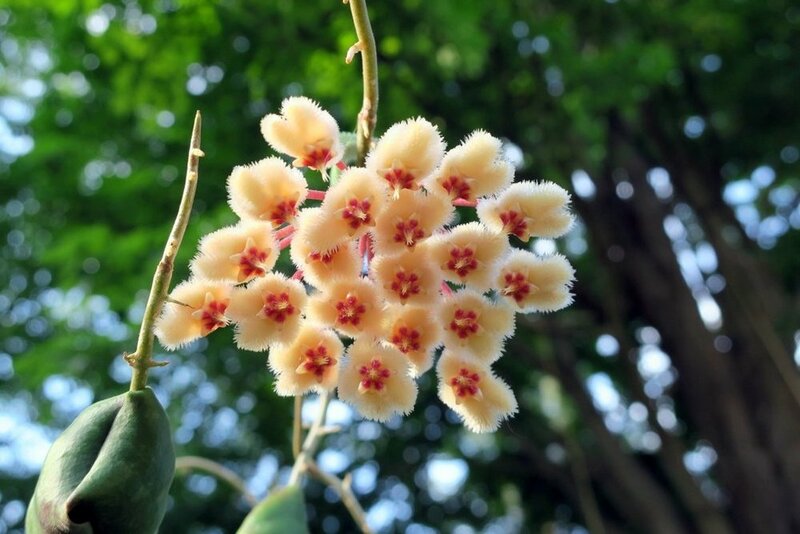 His favourite Hoya is H. cumingiana, a rapidly-growing Hoya whose flowers smell of cinnamon and spices. There are three groups of Hoyas - those that like it cool, from 10C to 25C, those that like 15/16C to 35C (the majority) and Hoyas that like it really warm, up to 35/40C. Humidity-wise, most Hoyas are happy around 50%. Some do need 60-70%, and Doug grows these in grow tents in his basement (pictured below). Hoya linearis is one of the Hoyas I grow: you can hear an On The Ledge mini-episode about it here. A variegated Hoya carnosa that put out all-white stems nearly died on me - Doug suggests removing all-white stems as soon as they start developing. When repotting, Doug uses a peat-based potting mix plus quarter of its weight of perlite or sponge rock plus fine orchid bark. He advises against potting Hoyas in terracotta pots but using net pots inside a cachepot. You can watch his video on this here. Don’t believe the myth that Hoyas like to be rootbound, advises Doug - he recommends repotting every two years at least. The main pests that attack Hoyas are aphids, mealies and spider mites. Doug uses Azamax, a refined neem oil treatment for plant pests, to treat all three. Hoyas are surprisingly adaptable when it comes to light and won’t mind a couple of hours of direct morning sun, but don’t expect them to thrive on a south-facing window in summer. The only Hoyas that that need full sun are lauterbackii Hoyas which are very very hard to flower. Hoya imperialis is the most impressive flower for home growers, with flowers 10cm across. H. macgillivrayi, but this one requires 12-14 day length days consistently to bloom - so you may need to deploy growlights in some climates. One of the downsides of many Hoyas is their propensity to produce copious nectar which drops on the ground (or your furniture). H. multiflora, H. lockii and H. imperialis. Having been wary of the technique in the past, Doug has now embraced rooting stem cuttings in water, which seems to work for pretty much all species. Watch Doug’s video on water rooting here. If you fancy growing a Hoya from seed, an excellent starting point is Hoya popashonii . Hoya kerrii are the heart-shaped plants often planted with a single leaf as a valentine’s gift but they won’t usually grow any bigger, sadly. They are sometimes sold with scenes or words painted on them. Doug suggested I expand my Hoya collection by growing the perfumed varieties H. lacunosa, H. calycina and H. griffithii. Patreon subscribers of $5 or more can hear Doug talking about semi-hydro culture, Dischidias and more in On The Ledge: An Extra Leaf 22. Want to become a Patreon supporter? Scroll down to find out how. I am giving a talk on the magic of houseplants at the Highgate Literary and Scientific Institution on April 9… if you are in the London area do come along! Full details here. There will be more talks and appearances coming up, so stay tuned for more details! I’d also like to hear your ideas for episodes: I will be doing another OTL sowalong soon, so order your seeds now - there’s info for UK and US growers on my blog. Some Hoyas that require higher humidity than is available in most homes can be grown in a grow tent. Photograph: Doug Chamberlain. Sign up with your email address to keep up with all the latest news from On The Ledge podcast. This week's show featured Roll Jordan Roll by the Joy Drops, An Instrument the Boy Called Happy Day Gorkana by Samuel Corwin and Plantation by Jason Shaw, all licensed under Creative Commons. Logo design by Jacqueline Colley.